Fall is here and it’s time to prepare your home for the chilly weather without sacrificing style, security, or enjoyment of your outdoors. One way to enjoy the outdoors in the Fall is to install carports. During the Fall and Winter, your home and your vehicles can be harmed by the weather elements. With carports, you can protect your vehicles by creating a garage area with a carports design. This will save you time, effort and money on constructing a full out garage. Professionally installed carports will protect your vehicles from rain, snow and even keep your vehicles cooler in the summer. Carports can be installed next to any entrance of your home to provide shelter to you and your family when entering the home. You can also create an outdoors living space underneath your carports. Enhance your home’s appearance and improve your quality of living with carports from Carroll Awning Company. Learn about our custom-made carports by reviewing our aluminum awnings. Through our combined locations and experience, Carroll Awning Company provides innovative craftsmanship, superb service, competitive pricing and unfailing attention to details in order to deliver a product that exceeds expectations. A satisfied customer is always our first priority. We work with each of our customers to design an awning or canopy product that meets all the requirements of the situation. Thousands of projects and satisfied, repeat customers have taught us price is a primary concern but not the only concern. 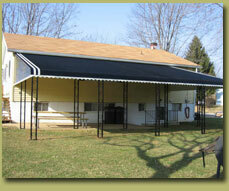 Therefore, quality and longevity of your awning are important factors in determining the true cost of the product. Material costs vary greatly and reflect the life expectancy and warrant they carry.